It startled me when I was doing my planning for the coming week when I realized it’s going to be May! How did that happen? Not that I’m complaining–the weather has been fabulous, the sun is shining, and spring is in the air! But it also means that summer is on the horizon, and even though we don’t get out of school until the end of June (I know…), there are a bunch of you that probably get out in May, and I realized I needed to get the 2016 Summer Schedule ready to go! 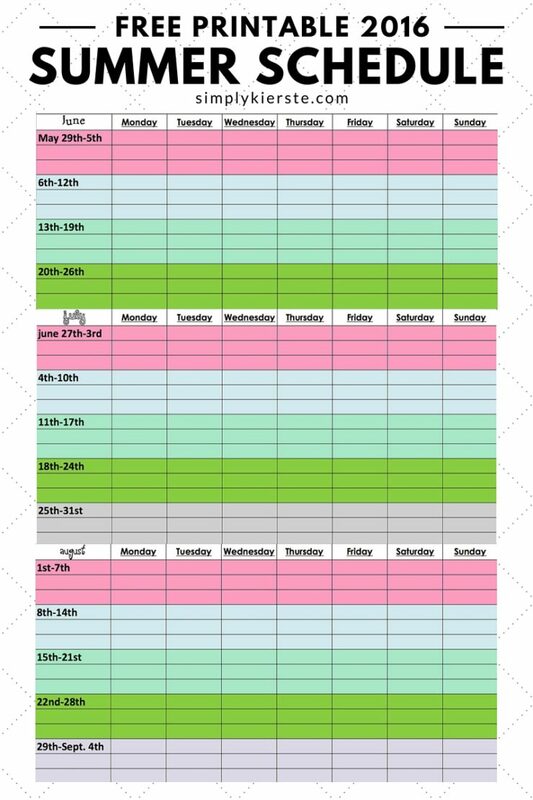 If you’re looking for a place to keep track of all of your summer activities and travel, this free printable is here to help. This is the sixth year I’ve posted this schedule–I’ve been using it for years, and can’t do without it. I love having an organized summer! I’ve been using this summer schedule to help me keep my summer organized for many years, and I still love it. Not only can I keep track of things like swimming lessons and day camps, but it’s really a place for me to jot down all the fun summer activities that are going on in our our area, so if we decided we want to go, I have all the info in one place. Free movies downtown, park days, pool hours, youth bureau activities, summer festivals, fruit picking schedules, children’s museum, sports camps, baseball games, and holiday celebrations are just some of the things that I like to keep track of, but I don’t want them cluttering up my regular calendar. There isn’t room for them all, plus we’re not necessarily going to do them all, but I do want to make sure I know when they’re happening. I started this years ago when my friends and I were planning out our summer, and starting compiling all of the things we were interested in. All the information just kept piling up, so I created this summer schedule, and it worked so well, other than changing the dates from year to year, I’ve left it the same. It’s an excel file, so it’s editable! You can either type in your info and print or keep it on your computer. I love google docs for that reason–I can access digital files anywhere, even on the go. Or…you can print it the schedule and write on it. There are three spaces per day, so it allows you to easily add more than one activity per day. I’ve created the file so that each month will print on a separate page, so the spaces are big enough to write in. However, of course since it’s editable, you can make any changes you need to in order to make it work for you best. 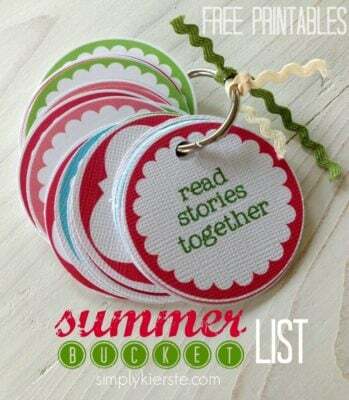 I have a few more summer ideas that you might like! Plus, check out my SUMMER FUN PAGE with even more! How to Make Summer Easier & More Fun with Your Kids! i just stumbled upon your blog. I absolutely love the bucket list tags. My daughter is 7 and she will love this so much. i hope i can get it put together before i show it to her. thanks so much for sharing!! Love the blank ones you added at the end. Can you give me the name of the font you used so that I could create a few of my own? It looks very similar to American Typewriter. It would be for my own personal use. If that’s proprietary, I understand. Just in case, it never hurts to ask. Thanks! Sure! Which specific font are you wondering about? Thanks! I am excited to try these out with my lil guy! I edited the schedule some and will use it this summer. Thanks! Will you be doing a summer schedule for 2017? I used this last year and it was a life saver for this momma! !